Composer, artist and singer - known as the girl with the guitar.Created over 250 songs, some of which sung by herself, others performed by famous BG pop stars. Author of film music. 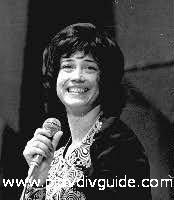 She is famous for the sountrack of the world-famous movie Koziat Rog (The Goats Horn). Award-winning singer and composer, she was in love with her native Plovdiv. So full of life and emotions, her friends and relatives still expect to see her any munite around. Although survivving an air-crash, a bomb terrorism attack, and eight operations, she outlived her beloved husband Niki by a year only.